The former Indian president said his mission was to guide and mentor the young, no matter in which country they were. As India remembers APJ Abdul Kalam, rightly celebrated as the "People’s President”, his loss is being mourned not just in his motherland. Kalam’s charisma was felt beyond our borders. It took only one lecture for the students of Peking University in Beijing - China’s most elite school - to feel the "Kalam charm". I had the good fortune of meeting Kalam during his first visit to China in 2012. His lecture at Peking University left the school’s president so impressed that Kalam was immediately offered a role as a honorary professor to come back. Never one to pass up an opportunity to educate and illuminate the minds of the young - whether they be in China or India - Kalam readily accepted. He was back two years later to fulfil his promise, in November last year, when he was also awarded an honorary professorship at the Peking University and invited to deliver a series of lectures. “My interaction with students here in 2012 was so powerful that their president had the thought of bringing me back as a teacher,” he told me in November. “In India, I have, in the last two decades, met about 18 million young people, mostly aged 12 to 25, in all parts of the country. On an average, I meet about one lakh young people every month." 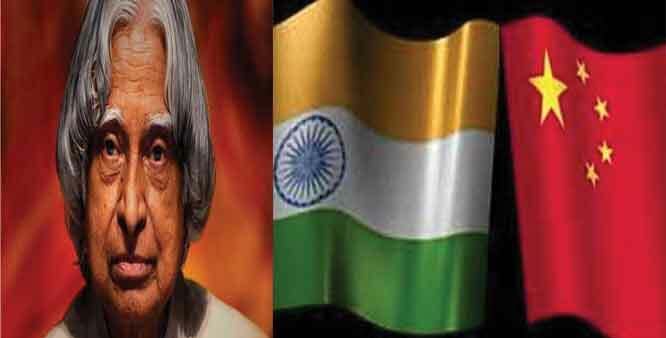 His mission, Kalam said then, was to guide and mentor the young, no matter in which country they were. "My profession is to steady the young people’s dreams. They have their own vision, irrespective of which country they belong to. They also have some pain... [among] the students, wherever they are, whether in Florida or Washington or Delhi or China, I found one unique quality – they have a dream. When they exceed 30 years of age, maybe the dream comes down. Below 30, dreams survive for some time. So that’s the age [when] I want to catch them and see it is not extinguished, and that the dream grows and grows”. In China, his lectures focused on harnessing solar power in space, and also on “creative leadership”, in which he spoke of the lessons from the lives of people ranging from Mahatma Gandhi and Nelson Mandela to Vikram Sarabhai, considered the father of India’s space programme, and E Sreedharan, for revolutionising public transport in India.